I appreciated the news media replaying the Clarence Thomas inquisition; it CLEARLY PORTRAYED that the accuser throughout MANY MANY YEARS never accused Clarence Thomas of anything and was amicably friendly via phone and in person and with group meetings with Clarence Thomas. Then completely out of the blue accuser Hill made accusations. NOW Kavanaugh after MANY MANY MANY YEARS is accused by person who cannot remember the year, the place, etc., etc. 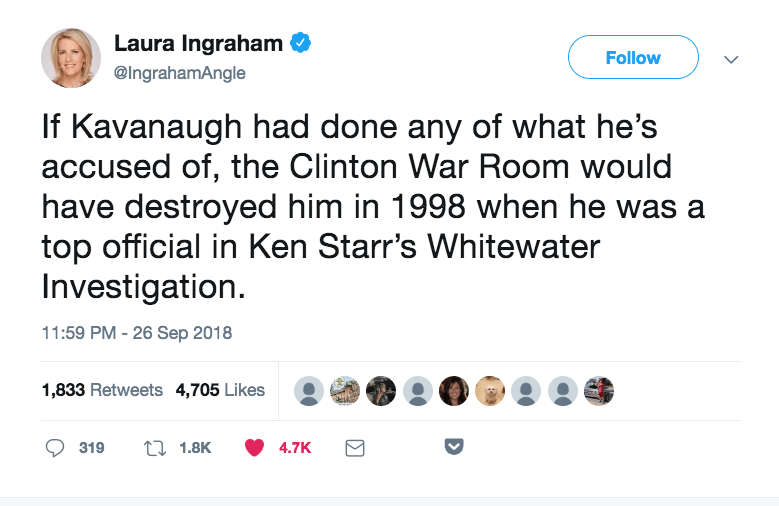 and same person never made accusation during Kavanaugh’s present and previous government appointments. KAVANAUGH DESERVES JUSTICE and SHOULD BE APPOINTED to the SUPREME COURT of the USA. Oh? Doctor Ford specified the year on the FOX feed I was watching.